MIAMI--(BUSINESS WIRE)--Ryder System, Inc. (NYSE:R), a leader in commercial fleet management, dedicated transportation, and supply chain solutions, announced today that all new vehicles that come into its North American commercial rental fleet will now include innovative safety technologies, such as forward looking radar and collision mitigation systems. The new vehicles will become the standard specification for Ryder’s commercial rental fleet as the Company responds to increasing demand from customers looking to improve fleet performance, safety, and driver job satisfaction. Ryder has offered these innovative safety technologies as an available option to its ChoiceLease customers for several years and the Company is now making those technologies standard for the first time within its Commercial Rental product line for new vehicles being delivered into service this spring. Ryder’s fleet of vehicles incorporates many other advanced technologies including automated manual transmissions, roll stability controls, and telematics. The Company also utilizes video monitoring and management systems in its Dedicated Transportation Solution (DTS) fleet. Ryder continually monitors emerging fleet technologies and works closely with leading technology providers and equipment manufacturers to provide feedback around functionality, usability, and adaptability. Ryder Commercial Rental provides customers with rental trucks on a short-term basis to meet their needs for supplemental capacity. Ryder serves customers at more than 400 convenient rental locations across the U.S. and Canada, staffed with a dedicated team of knowledgeable rental agents, and stocked with an inventory of over 35,000 recent-model vehicles. All rental vehicles are backed by Ryder’s Rental Service Guarantee. To rent a truck, call 1-800-345-9282 or visit reservations.ryder.com. 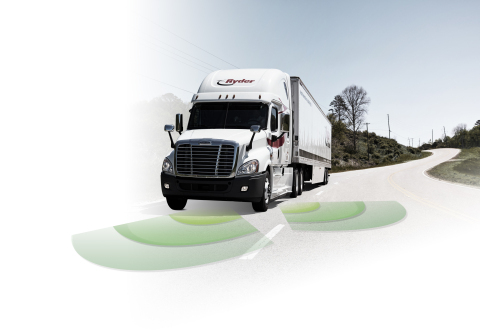 Ryder is a FORTUNE 500® commercial fleet management, dedicated transportation, and supply chain solutions company. Ryder’s stock (NYSE:R) is a component of the Dow Jones Transportation Average and the Standard & Poor’s 500 Index. Ryder has been named among FORTUNE’s World’s Most Admired Companies, and has been recognized for its industry-leading practices in third-party logistics, environmentally-friendly fleet and supply chain solutions, and world-class safety and security programs. The Company is a proud member of the American Red Cross Disaster Responder Program, supporting national and local disaster preparedness and response efforts. For more information, visit www.ryder.com,and follow us on our Online Newsroom and social media pages: Facebook, LinkedIn, Twitter, Instagram, and YouTube.